You remember Sarah, the one who brought us the crunchiest caramel popcorn in the world. Well, now it's our turn to give something to Sarah. 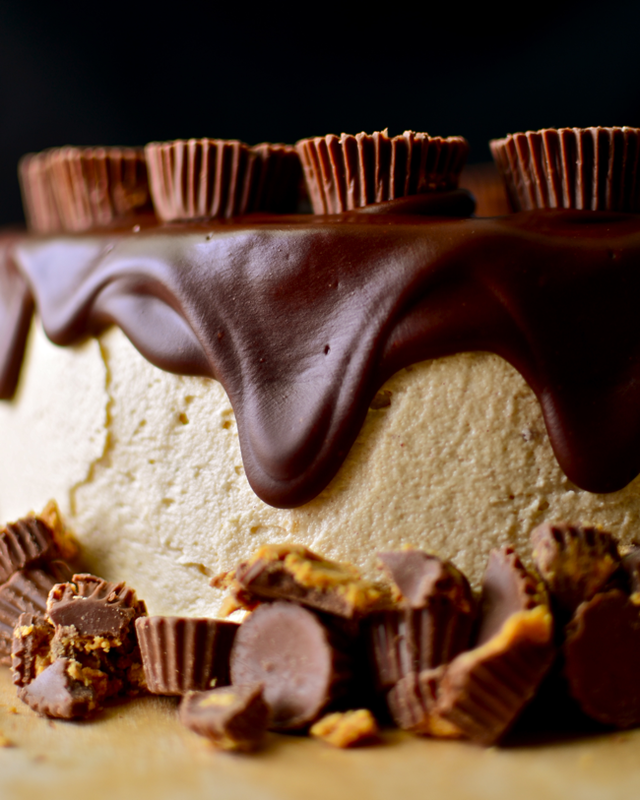 You see, Sarah, like all sane people, has a true passion for all things chocolate peanut butter. So for her birthday, I made her this. Of course when I brought this cake over for the party, I decided to be annoying and tell her I had to take a left over piece home so I could photograph it for you guys. It only took me about five hours to choose the perfect piece to take home. 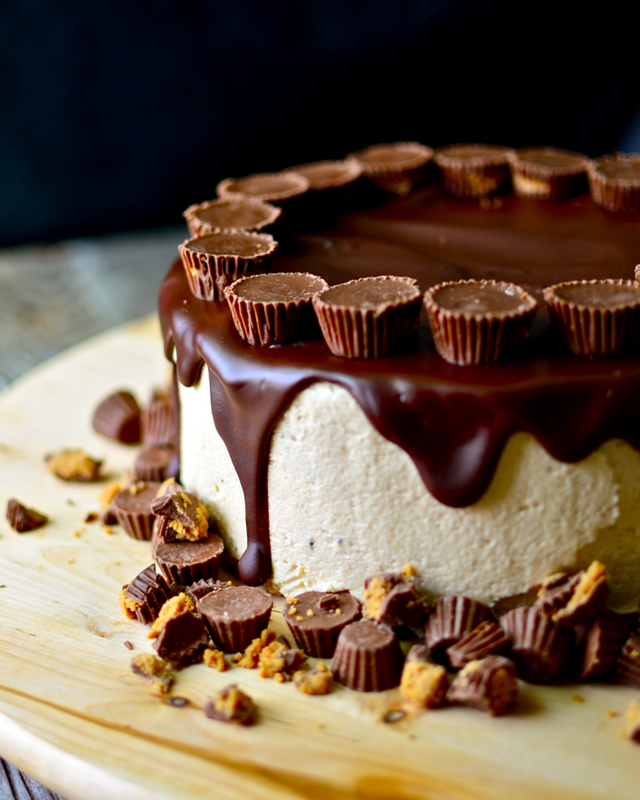 It had the most perfectly smooth edges, the fluffiest frosting, the most perfectly nestled peanut butter cup, and of course, the most perfect ganache. So when I got home that night, I set it on the counter, ready to photograph when the sun came out in the morning. 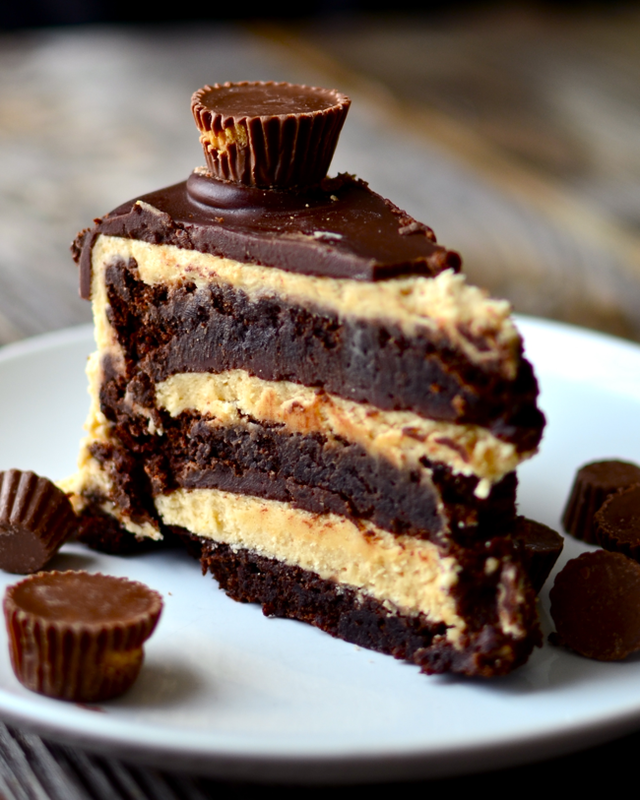 Imagine my horror and rage when I woke to find that my most perfect slice of chocolate peanut butter cake had been destroyed. Someone had nibbled off the whole tip of the perfect ganache. After a thorough investigation, the culprit was discovered. I won't name names, but I'll give you a hint, it's the sister that is now living in eternal disgrace for her crime. Seriously though. I was really pretty levelheaded and all is now forgiven. 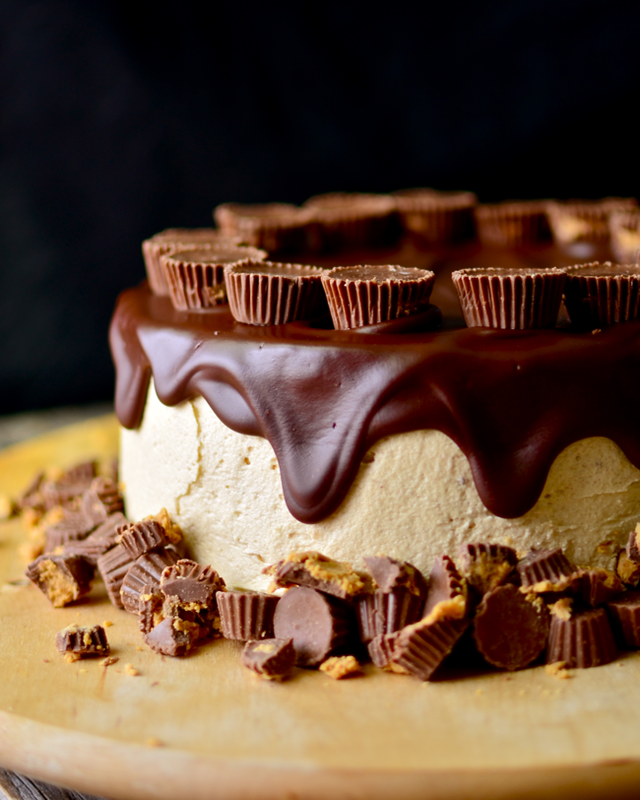 Okay, so I might have thrown a few Reese's cups at her face or told that she could never eat cake in this town again, I don't remember. Just don't ask her for her side of the story. Preheat the oven to 350ºF. Grease three 8 inch cake pans (depending on how many layers you want) and line with parchment paper. Meanwhile beat together the eggs and sugar for about five minutes at high speed until pale and more than doubled in volume. Add the vanilla to the eggs and beat until combined. Sift in the cocoa and salt and mix again until combined. Stream in the melted chocolate and butter and beat until combined. Divide into prepared cake pans and bake for about 20-25 minutes or until toothpick comes out with some crumbs attached but no longer wet. Melt in the microwave at 50% power, stirring ever thirty seconds. 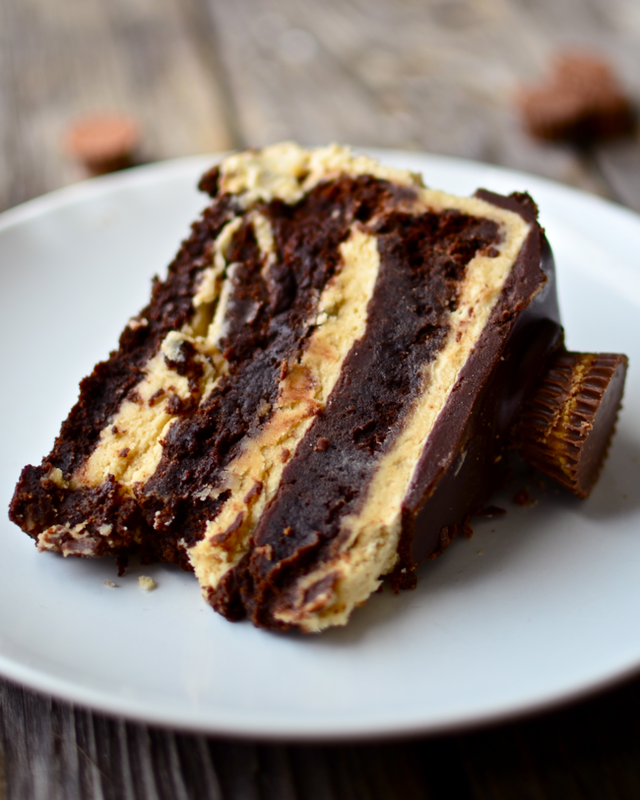 Layer each layer of cake with a layer of slightly cooled ganache and a layer of buttercream. Then frost the cake with the rest of the buttercream and top with remaining ganache. 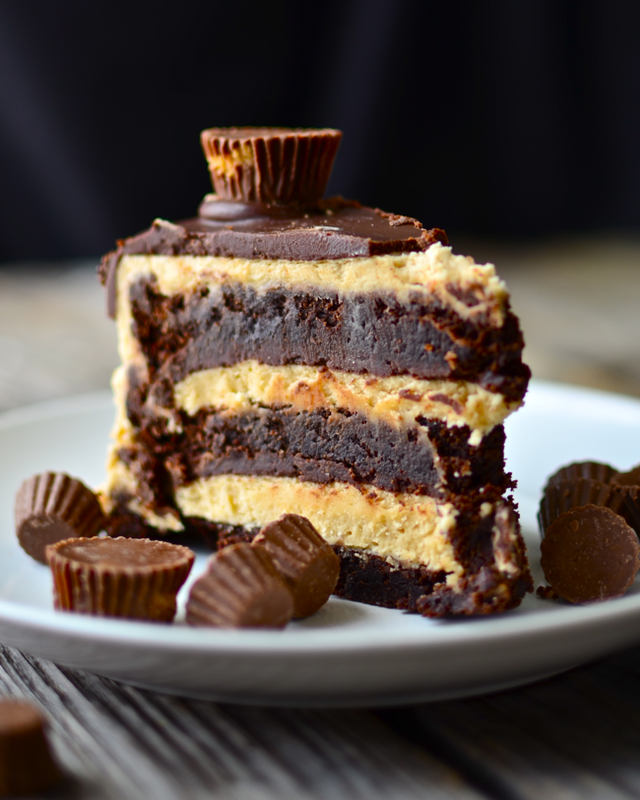 Top with Reese's Peanut Butter Cups. Don't forget to follow on Facebook, Twitter, Pinterest, and Instagram. Or to subscribe via email, enter your email address in the top right sidebar! Woooohooooo that looks insanely good!! WOWOWOWOW!!! This looks AH-mazhing!! seriously! ...out of this world delicious!! Great recipe!! Don't Reece's have gluten? Do you know a gluten free substitute? Corn starch is an ingredient in powdered sugar. Some specialty stores sell one that is grain free.